Moving an entire house may not be something that you’ve ever considered before. But house relocation business isn’t just for the super-rich or governments moving heritage buildings. It’s something that individuals do everyday. Instead of just relocating their possessions, they move the entire house structure too. This can be an expensive process that you can build a business around. So if you’ve never considered starting a house relocation business, it’s time to read this guide. We’re going to show you exactly what the house relocation business is all about. 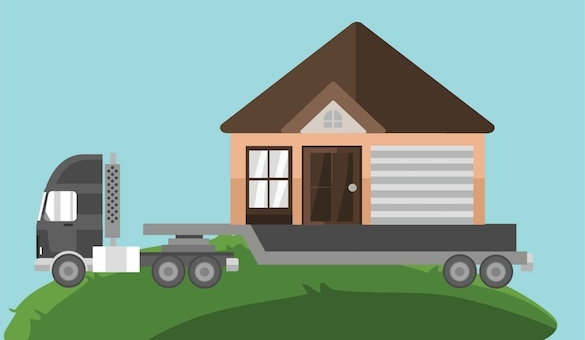 The concept of moving a house may seem entirely alien, but it’s exactly what you might think. Everything that isn’t nailed down is removed from the house and then it’s removed from the ground. Sometimes the foundations will also come, depending on the type of building. The entire house is transported on top of a huge truck and moved to its new location. The concept is that simple, but the execution is slightly more complex. Your business will be responsible for moving the house in its entirety from one location to another. There are many products and solutions that will allow your team to move the largest structures. These tools are known as skates and roller dollies. They are used by house relocation businesses, rigging companies and machinery movers. When you start your house moving business, you will have to use these tools to load and move an entire house structure. How Much Can You Charge To Move A House? The sticker price of house relocation is high, but when you compare it to the cost of buying a new home, as well as the associated costs of selling a home, the cost can be lower. You can charge anywhere from $100,000-$200,000 to move one house. Of course, only certain homes are eligible. It doesn’t make sense to perform a house relocation on a low-value home. The cost would likely be higher than the home. Moreover, the customer has to be willing to pay for the home to get a new foundation and all the inspections. Clearly, this can be a profitable business if you are able to move multiple houses in a year. You could end up with millions of dollars in revenues. What Are The Business Costs? Your main costs are labor and equipment. Throughout the process, you’ll need to price in the cost of the heavy vehicle truck and its associated running costs. It also takes a crew of at least three people to manage the process. Additionally, you will need licenses, business insurance, permits and municipality approval. There will be a fair amount of administrative costs to handle all the legal implications and documentation. Then, you will have to budget for how far the house needs to be moved. Obviously, moving a house a few miles is much cheaper than several dozen miles. Based on the complexity of the job, your house relocation business should add some margin just in case any challenges arise. Sometimes it just makes financial sense to move a home over building or buying a new one. But there’s also the sentimental value to take into account. If someone really loves their home, maybe spending an extra $10,000 is a worthwhile investment. In fact, many people would be open to making that decision. However, it’s a lot of work to replace certain parts of the home. For example, the roof may have to be replaced despite having the best team working on the project. The home may have even suffered a little bit of damage during the journey. These are costs that your customers have to be willing to take. Your ideal target market should include wealthy individuals who have valuable homes. Or, it can also include governments, businesses or organizations that need to move large buildings. Since the costs are so much higher to build, these types of customers can afford to pay for your services. This kind of business definitely doesn’t make organizational or financial sense for everyone. Do your research before you get into it and make sure you have people with experience who can do the work. When moving large homes, there are many risks and factors to take into account. Anything can happen while transporting a house. You should have a high tolerance for risk and be willing to solve complex challenges to move homes as a business.